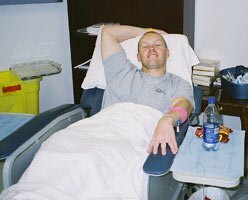 Rebuilt: From Chemo To Superbody! I would like to share my story and tell you how friends and family can help a person get through anything. 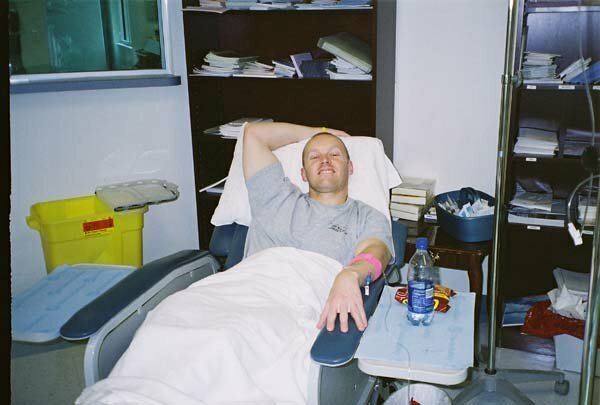 Learn about how I dealt with a battle against Hodgkin's Lymphoma. "Bring your shoulder around... flex those deltoids... keep the abs tight." It was late on Thursday night June 2nd, 2005, and my workout partners were critiquing my posing after hours at my workplace. It had seemed like an eternity; exactly one year ago I was in the middle of chemotherapy treatments. This night one year ago I would have been preparing for my next chemo treatment. Getting ready to feel weak and sick to my stomach for the umpteenth time. But tonight I was flexing, prepping for my next show; the 2005 Musclemania Superbody in Miami, Florida. January 2004. After coming home from Afghanistan with the Air National Guard I was ready to go. Motivated, excited, and eager to get back into serious training again. Being overseas was a unique experience and one I will never forget, but it was time to get ready to compete again. Just prior to being shipped over I had competed in two shows. The New Orleans show and the Texas Musclemania one week prior to being shipped out. People thought I was crazy for dieting that close to leaving for who knows how long, but I won the novice division and felt great. So with a win and Afghanistan behind me it was time to go to work. At The Hospital & After Beating Cancer! I was driving to work after recovery from a procedure I had undergone to remove and biopsy a lymph node on my neck. I thought nothing of it. As a matter of fact I had one removed before and it was benign. It was just another speed bump or so I thought. Then I got a phone call from my general practitioner saying that I had Hodgkin's Lymphoma, an immune system cancer (which my brother had and my father had twice). Overall, it is more common in males, except for the nodular sclerosis variant (see below) of Hodgkin disease, which is more common in women. I was shocked and numb. I thought it would have skipped me somehow, or they had the results mixed up with someone else, or that he read the report wrong. I did not know what to do! Do I turn around and go home? Do I go to work and stay in the routine? Or do I just pull over and collect my thoughts? It was the best advice for my mind and body. My friend had just won the Musclemania Delta Junior title. Well over six months into chemotherapy when I am supposed to be weaker than ever and barely able to move from the treatment I had received just the day before I was filled with adrenaline! I should have been home in bed resting, attempting to eat and hydrate my body from the toxins that had been shoved in my veins. But, no! I would not have missed this night. My two great friends Thayer (Tyson we call him) and Carey were competing. I had to see them; I had to be surrounded by my favorite sport. It had been too long. My girlfriend Brooke was there by my side as always cheering them on and keeping an eye on me. It was a great night. "If we are going to beat it, let's beat it for good." "It was good that you came back from Afghanistan when you did so we would be able to beat this thing in time." It was great to see thirty indeed. Additionally, I always say I have two great women in my life, my girlfriend Brooke and my Mother. They are definitely the glue that holds all of the men together in this family. Very last treatment. What a ride! It's over! Brooke and I bought a few edible gifts for the nursing staff, which I could not stomach. With half of my hair missing, my G.I. tract messed up, and very little appetite, nothing seemed appetizing except for the privilege to walk out of that clinic on chemo for the last time. My friends, family, everyone at the National Guard unit, coworkers, and especially Brooke helped me walk out that door that day whether they knew it or not. Heck, even Lou Zwick from Musclemania called periodically to check up on me. All of those doctor appointments, emergency room visits, hospital stays, late nights, Brooke was there by my side, sleeping in the hospital room with me, taking me where I needed to be at the chemo treatments. It seemed like a long and endless road but it was finally over. Over the next few months it was back to the gym with a goal: to come back better than before, not to give into the cancer story. What I mean is, I could have easily gave cancer as the excuse for all of my shortcomings. If I was tired one day and did not feel like training I could very well blame chemo. But the fact of the matter was that I was healthy as an ox; and eating like one too. I gained an average of five pounds per week. Unfortunately, scientists have yet to be able to locate specific features of malignant cells that would make them uniquely targetable (barring some recent examples, such as the Philadelphia chromosome as targeted by imatinib). Before treatment I was 235 lbs. and after I had gone down to about 195-198 lbs. My strength was doubling each week as well. I will never be tired again! I had been tired for most of 2004 and I was tired of being tired! I had so much pent up emotion and drive during treatment it was all coming out now. Training was six days per week, no less! Heavy, hard and strong. So there I was, getting ready for my first show in almost two years. Will my body be able to go through the dieting and rigors of contest prep? Will I be better conditioned, bigger, more symmetrical? All I could do was find out for myself.